Start a spray tan career today. 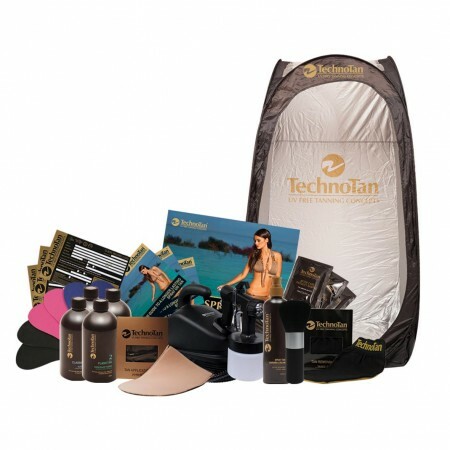 TechnoTan offers a range of tanning packages ideal for home based spray tanners, mobile operators and salons wishing to increase their profits. Please Note: Training is Extra, and is not included in the Crazy Starter Package. Package only available to experienced or trained tanners. *Colours may vary depending on stock availability. Please Note: Training is Extra, and is not included in the Basic Starter Package. Package only available to experienced or trained tanners. Please Note: Training is included in the Super Starter Package. Package only available to experienced or trained tanners. Please Note: Training is included in the Economy Package. Package only available to experienced or trained tanners. Please Note: Training is included in the Deluxe Package. Package only available to experienced or trained tanners. Please Note: Training is included in the Premier Package. Package only available to experienced or trained tanners.